Visit us at CeBIT 2012. The EU FP-7 Project GINSENG will be presenting a demonstrator for Closed Loop Control in Wireless Sensor Networks on the booth of Lower Saxony (Hall 26, C50). INGA is a major part of this demonstrator. If you need a CeBIT ticket just send an E-Mail to Felix Büsching. See you at the booth! We were glad to present a regular demonstration of INGA at SenSys 2011 confernece in Seattle. In this demo, we presented some exemplary applications for INGA, our new and affordable wireless sensor node for general applications. 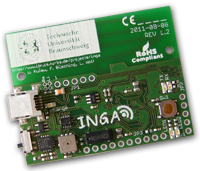 INGA’s hardware design is completely under open source license and it runs the open source operating system Contiki ”out of the box”. Several up-to-date sensors are included in the basic design and we developed it for research, medical applications and universal usage. Take a look at our SenSys 2011 – INGA Demo Paper.